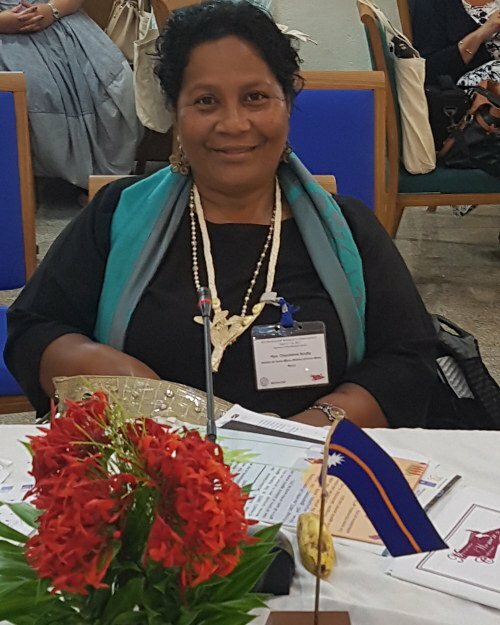 When Honourable Charmaine Eraidinomo Scotty was elected member of parliament in Nauru’s June 2013 elections, she made history as only the second woman to do so, following in the footsteps of Ruby Dediya (who was MP from 1986 to 1992 and from 1995 to 1997). Following her election to parliament, Hon. Scotty was appointed by newly elected President Baron Waqa to serve in his administration as Minister for Home Affairs (which includes Women’s Affairs), Education, Youth, and Land Management, a position she currently holds. As there are no political parties in Nauru, Scotty sits as an independent. There are currently only two women in the country’s 19-member parliament. Hon. Scotty is no stranger to government. Prior to joining politics, she served as an administrator in the highest levels of public service, culminating as permanent secretary in the Ministries of Health, Home Affairs and Justice. This portrait of Charmaine Eraidinomo Scotty was first published by the Pacific Community for the 70 Inspiring Women campaign, it is reproduced here with their permission.